Provence always pops up in our minds as a top destination for long holidays. Perhaps, this is one of the most frequented places in Europe. When I was a little girl I had always dreamed of the lavender fields and those tiny streets lined up with pale-lemon stone houses, and all this generously bathed in sunshine. A lot of sunshine. Starry nights and the incessant song of the crickets. Years after, I went to Provence making my dream come true. Here you will find some of the most beautiful villages in Provence that should not miss on your itinerary in this lovely region in France. Provence is the perfect place to spend your summer annual paid leave. Pick up one place as a base and explore the region. You won´t be disappointed as you will discover there some of the most beautiful places in France. In France there´s even an official list of the most beautiful villages (Les Plus Beaux Villages de France). In order for a village to be qualified for this list, it has to satisfy 2 major criteria: it should have a population of under 2000 inhabitants and have at least 2 protected monuments. There are also numerous other requirements about the architecture, the quality of life, the engagement of the community, etc. The application procedure is very tough and only 1 in 5 villages makes it to the list. Most of the places we had visited during our Provence holidays are not included in the official list, but nonetheless they complied with my criteria of being among the most charming places in France. Aiguines is a very tiny place with less than 300 inhabitants. 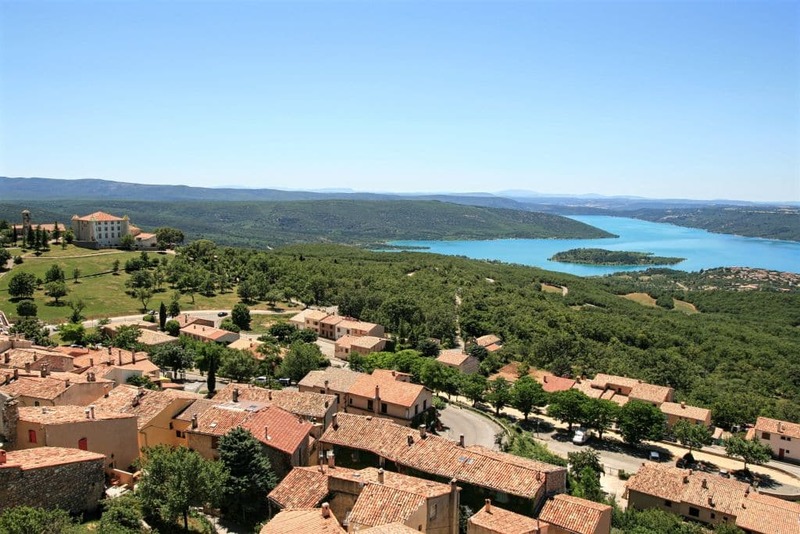 It offers one of the most stunning views on the Lake of Sainte-Croix. There’s also a castle in the village built in the Middle Ages and restored in the 1980-s. Today, the castle is a private property and to my regret cannot be visited. Aiguines has a lovely square with a fountain and a few cafés. This is the only village included in the famous list with the most beautiful villages in France. It is also a very touristy place. If you don’t mind the crowds in the summer, you are free to enjoy the special Provençal spirit caught up in every cobbled stone and in each small café. Moustiers is famous for its ceramics and the Star of Moustiers. The last is the subject of many legends and actually nobody knows as to why it has been suspended above the village. Today this is the 11th star to hang on a 135 m long chain between two rocks. This small place has a very interesting history. In 1971 when they started building the Lake of Sainte-Croix, the village had to move. Today, it is located at some 400 m from its original location, which now is in the middle of the lake. They say that when the water is low in the lake you can spot the top of the church spire, but it could be just another modern-times legend. Les Salles is a popular resort for the summer holidays at the lake. Once standing on a rock, Bauduen is another village that had to move – it looks like it had descended, as today it´s lying on the lake shore. It´s not very touristy, so you can walk all alone through the labyrinth of narrow passages, or enjoy a drink at one of the cafés with views to the lake. Isn't this simply magical - a small piece of blue water, topped with the green of a hill and framed in a narrow passage formed by old stone houses! Take a walk along those tiny passages and feel the real Provence! I still wonder why this village hadn't made it to the official list of the most beautiful villages in France. Castellane is one of the oldest towns in Provence. It was mentioned for the first time in historical texts around 970, but the first settlements date back to the Neolithic Age. Castellane is dominated by the Roc – a gigantic square-shaped cliff. On the top of the cliff there is the chapel of Notre-Dame du Roc. Climbing takes about 20 minutes and once on the top you will be rewarded with a magnificent view over the village and the surroundings. Another special place in Castellane is the pentagonal tower, a part of the town´s 14th century fortification system. On the way to Notre-Dame du Roc. You can spot the chapel in the distance. DISCLAIMER: This post contains affiliate links. If you make a purchase via one of the links, I will earn commission. For full disclosure, read the site’s Terms and conditions. For our holidays we chose as base a camping in Aiguines. This region is one of the most popular touristic destinations and offers a wide range of accommodations: from camping sites, to rural homes (the so called gîtes), resorts, all types of hotels and anything you can think of. Lonely Planet travel guides are indispensable for any tourist. Choose one from the many guides dedicated to Provence & Southern France to be your travel companion on your next Provence adventure. All books are available also as an e-book or in pdf. Provence might be No. 1 travel destination in France, but there are so many other beautiful regions. What are you going to do this summer? If you are in love with France you might find it interesting to visit the Dordogne and its beautiful places. Do you have already plans for the summer holidays, but still want to escape to France for a long weekend, check out my 4 days in Fougéres and Giverny suggestion. Provence is not all about small charming places, it has stunning nature that just waits to be explored. Here you can find my complete guide on the Gorges du Verdon, where I am featuring also the Lake of Sainte-Croix and the Martel Trail (Sentier Martel). We also like to find charming places that are off the official lists. I love the tiny streets with stone houses. It looks pretty quiet too, I don’t see a lot of tourists in your photos. I think we would enjoy a place like this! I have always identified Provence with the breathtaking lavender fields. However I see that there is much more to it and this post is indeed a revelation. I love the picturesque towns and villages, they seem straight out of a fairy tale. They have an endearing old world charm which makes them so enchanting. Looks really nice! I lived in Alsace, and there were also some villages from this top. They are very charming, I really enjoyed visiting them even more than the big cities. Never went to Provence though, this will be on my list now. Provence is definitely still on my list. Beautiful photos! Oh Provence, this post brings me some many great memories! I used to lived in the south of France for a while and travelled quite extensively around the area. I also visited some of these little villages and they are so pretty! Woohooo I’m driving down to Provence in three weeks and I CANNOT wait!!! It’s also always been a dream of mine to see the lavender fields. And don’t even get me started on the picturesque villages and cute little streets and houses. Thanks for sharing! What a gorgeous corner of France. I always forget to look closer to home when I am planning trips but I am sorely tempted to pop across the Channel to France now. Did you go in any of the lakes? They look so inviting. Oh wow! These places look wonderful. I would want to relocate in any of those places if only I could. The lifestyle there must be stress-free. You took some great photos. I like the photo of the shop the most. It looks nice and the facade is lovely. I love these small villages in France, they are so charming and you feel like you were transported to the past! Heck that is some serious scenery. I always hear so much good about France and it appears I need to add Provence to the list now. Such a stunning place and great photos to it all the justice. Nice work. IAlmost every summer, I used to spent my childhood summer vacation in France. When I read your post, memories from beautiful France came back again. I didn’t went to France for a long ttime, maybe it is time soon. These are gorgeous! So many villages to be discovered in France… Makes me wanna go to all of them! Wow all those places look so quaint. So far I have just been in Avignon, which is quite a larger city but now I wish I had visited smaller villages as well. The food must be outstanding there. What charming villages, and very much off-the-beaten track. Beautiful photos too!